In this IBM® Redguide™ publication, we look closely at network-related security risks such as targeted attacks, worms, bots, intrusion attempts, phishing scams, and so on. These threats target vulnerabilities in IT systems, workstations, and applications and can have a crippling financial effect on all organizations, disrupting business processes, and causing loss of confidential and proprietary information. 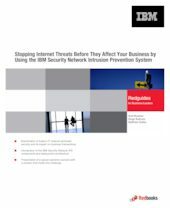 To better understand how these threats are targeting your organization, we examine the composition of today’s IT network perimeter, which has been diluted from a well-defined set of ingress and egress points to a mesh of undetectable flows from devices that are capable of accessing and penetrating every organization’s resources. The days of keeping the attackers out by building a well-defined wall are definitely over. Businesses and organizations require collaboration with internal and external business partners, customers, and employees, which further removes walls and protective barriers. After identifying these increasing threats, we describe how the IBM Security Network Intrusion Prevention System (IPS) can help you consolidate intrusion prevention with data and web application security into a single, optimized appliance for faster, more accurate security protection. The hardware appliance is preloaded and preconfigured with IBM security software and extends the capabilities of the IBM X-Force® research team, to address high-performance network security. The audience for this guide includes business leaders, decision makers, network managers, IT security managers, and IT and business consultants.